Bill Bailey did two tours as WAKY's morning man: 1970-1981 and 1985-1986. On this page you can download Bill Bailey WAKY airchecks. All are in MP3 format and are arranged chronologically (when dates are available). The then-unemployed Bill Bailey guests on WHAS' Terry Meiners PM drive show. This is a must-hear for any serious Bill Bailey fan! Despite an extended period of being off the air, this Fall '89 scoped recording shows Bailey in prime form on his first show on Lexington's WVLK, where he did afternoon drive for over four years. morning man Les Cook communicates telephonically with the Duke of Louisville. 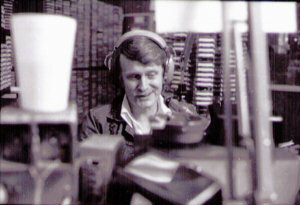 One day in 1977, Bill Bailey and Reed Yadon originated the WAKY morning show from the home of contest winners J.K. and Doris Adams in Louisville. Luckily for us, this piece of broadcast history was captured on Super 8 film -- and was preserved until May, 2005 when it was converted into digital format. You see and hear the Duke and Reed have breakfast with the Adams and then do several breaks from the dining room table. If you're a Bill Bailey fan who's never had the honor of watching him in action, this is a "must see." A great big Super 79 thank you to Swain Ottman of Shepherdsville, Kentucky who contributed the video to 79WAKY.com, as well as Bill and Linda Ottman of Louisville who paid for the format transfer. The cameraman and editor was Rusty Heaps.